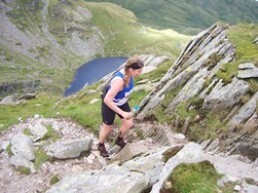 Fell Running also known as Mountain or Hill Running is perhaps the most demanding and exciting form of running. It requires more than just putting one foot in front of the other. 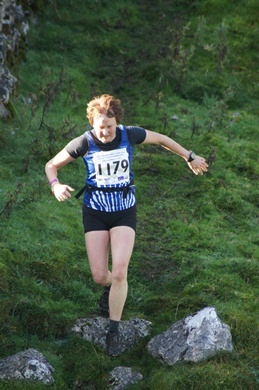 Many races require competitors to be able to navigate over rough moorland and mountain terrain and the weather can have a major impact on an event. Others, though will be much more like hard, hilly cross country with routes marked and marshalled. Races can be short (3 – 5 kms) or long (50+kms) and anything in between. There are some multi-day events, such as mountain marathons that involve carrying the gear for an enforced overnight camp. They will always involve considerable up hill bits followed by downhill bits. The terrain can be anything from good paths and tracks via sapping boggy and tussocky ground to steep rocky sections, sometimes even involving mild scrambling. There will be glorious ridge runs with the sun on your back and the world at your feet and fantastic swooping descents. There will be days groping through thick fog or battling gale force winds. Some events can only be done in teams of two and some are run much more along orienteering lines with navigation and route choice a major challenge. In all longer races runners must carry some minimal survival gear. 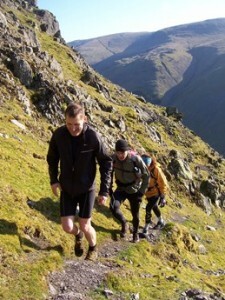 The Club is affiliated to the Fell Runners Association and is one of the very few Southern clubs that have a consistent presence on the fells in major events and relay championships. Club members regularly travel to South Wales, Snowdonia, The Peak District, Yorkshire Dales and the Lakes to compete and it’s usually possible to arrange lifts. The club has a good range of experience for new members to draw on. Runners thinking of trying out the fells or moving on from road running will always be warmly welcomed and encouraged and advice is always available. Seven current members have completed the Bob Graham Round and support for long distance challenges is always forthcoming. For further advice on fell running see the FRA website: www.fellrunner.org.uk or email Tring member Rick Ansell at fellrunning@tringrunningclub.org.uk.